Ryan Hall – Olympic marathoner and record-holder in half-marathon. Chris Carmichael – Former Olympian cyclist and coach to Lance Armstrong. Nissan has messaged the content with their “Durability tested to the next level” tagline and integrated into their brand-level SHIFT campaign. The Nissan Altima was tested through some durability exercises that emulate the riggers of everyday driving: potholes, road debris, and extreme heat; though, the last one we don’t really get in Michigan. Unfortunately, the Nissan content on the Master the Shift site is very limited and only show photos with descriptions instead of video content proving out the durability. This isn’t a bad thing though since the content budget needed to focus more on content for the passion interest and less on the car, since the car can be discussed on the Nissan site. 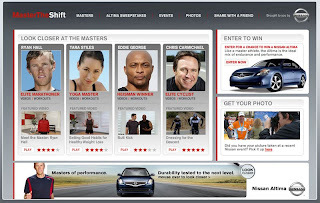 Upcoming marathon events will having Nissan_SHIFT booths that promote the Altima and the Master the Shift website. People at the event will have pictures taken, I assume the picture is taken at the Nissan booth, that can then be viewed online if they stop by for a SHIFT_performance Passport card that has an ID number for retrieving photos. It’s a typical, but well-done execution to tie event and online marketing together. Besides any online media that is bought, it is sure to be the other main traffic driver for the site. I learned about the site from an advertisement on Runner’s World website. The online media is prominently featuring the expert appealing to the site’s passion interest, as opposed to pushing the Altima in its imagery. The ad is well done because it is a strong awareness buy that is better placed with a consumer’s interest and through a special interest “celebrity” and I really like this approach versus a homepage takeover on a portal site like Yahoo! or AOL. This site has content scheduled through March 2010, must be when the budget allocation for the campaign is set to expire or get re-approved, if the program is working well. How do I know this? Well, if you click on various “Channels” within each expert’s Master class, you are informed that various channels are coming in July, September, December, and all the way out to March 2010. Since it is a staggered schedule for content updates, it would’ve been a nice touch on the site to place a “Sign Up for Updates” button next to the Coming date indicators. Other than entering the Altima Sweepstakes, there seems no way to sign up for future content changes. This approach works very well in the GMC Professional Grade site that is on AOL Living. They actually let you sign up for a newsletter that sends out regular content notifications as things are updated. It remains to be seen if the Nissan contest will do something similar, but there is still no updates link or newsletter you can request; too bad, since it is a site that has a strong editorial content plan. Hopefully, now that Nissan has my name, they’ll let me know when new content shows up on the site; though, I still don’t know if they are going to do that, even after entering their contest. I could definitely use the content, as I’m about to finish my first month of running. Yet, I doubt I’ll need the advice of an Olympic marathon runner. My running knowledge needs are very modest, but it’s great seeing a site that features running right alongside of my favorite passion – cars, even if it is a rather sedate Nissan Altima. Thanks Wilson. It's always great hearing people like the blog. I enjoy doing it.